Asparagus is one of those seasonal vegetables that we make gluttons of ourselves with when it is in season, until the point that we are nearly tired of it when it is gone. I say nearly tired, because I don’t think that I could get truly weary of asparagus. It is just so fresh and green and wonderful. After a long winter of eating darker greens, it is nice to eat something sweet, tender and new. And it helps that each year, I come up with new ways to cook the little verdant spears. I guess if I just steamed it and dressed it with lemon and butter every day, it -would- get tiresome. But no, I like to roast it, grill it, put it in pasta sauces and stir fries. Last week, I discovered that it is really good in Panang Beef Curry instead of string beans, and I came up with an utterly simple preparation using the Bengali spice mixture, panch phoron. Made of equal parts of cumin, fenugreek, nigella, mustard and fennel seeds, panch phoron is a magical mixture. These seeds, when toasted in oil or butter, and tossed with a lightly cooked vegetable bring out the natural delicious nature of that vegetable, while adding a myriad of sweet, musky, oniony and hot flavors of their own. You don’t even need a formal recipe to make this: it contains five ingredients. Butter, panch phoron, asparagus, lemon juice, and a sprinkle of salt. That is it. For one half pound of asparagus, I used two tablespoons of butter, a teaspoon and a half of panch phoron, the juice of one medium lemon and a pinch or two of salt. All you have to do is prepare your asparagus for cooking by breaking off the tough ends, and cutting it into bite sized pieces or leaving the spears whole, as you prefer. Then, you melt the butter in a heavy bottomed pan and toast the panch phoron in it until it is brown and fragrant. Then, toss in the asparagus and cook, tossing and stirring until the skin of it brightens slightly. Then add half the lemon juice, and steam the asparagus in it until it is done, then add the rest of the lemon juice and salt and stir. Voila! An amazingly flavorful side dish that is brainlessly simple to do, yet which tastes sophisticated and complex. Hmm I’ll have to try this. I have extra asparagus, extra ponch phoron, and half a lemon. Thanks for showing me new ways to use panch-phoran :). I’ll have to try this. Looks and sounds yummy. I hope other folks like this one as much as we did. It was delicious. This sounds like a great use for Panch Phoron and also for asparagus. So what was the accompanying meal that’s hiding in your photo? One dish was the Kashmiri wild mushroom curry, and the other was lamb vindaloo. 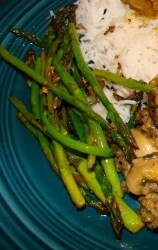 I tried the asparagus with panch-phoron today, and it was sooo good. It was soothing and tasty. Thanks for this new idea. I would like to share a dal/lentil soup that I make with panch phoron with you. It’s reall easy, but it is very flavorful and it is my comfort food with rice. All I do is add panch-phoron to heated vegetable oil until they are fragrant and brownish. To this I add the pink lentil (‘masoor dal’ in many Indian languages without their). Add water, salt and pinch of turmeric and let it boil until it is done. Variations: fry onion until brown after heating the panch-phoron and then adding the lentil. Or add cilantro leaves at the end. I also have a sweet tomato chutney in my (dormant) website. Sorry for some of the incomplete sentences in my last comment. My last sentences was meant to be ‘I also have a sweet tomato chutney in my (dormant) website that uses panch phoron’. Mystic–I made your dal tonight–it is excellent! I made the version with onions–and, I added cilantro at the end, too. Morganna and I both adore cilantro. When it is tomato season, perhaps I will also try your chutney!